The other day as I was working in my sewing room I heard, "Mama, can I sew with you today?" "Of course you can," I answered, "what would you like to make?" "Can I make a horse?" 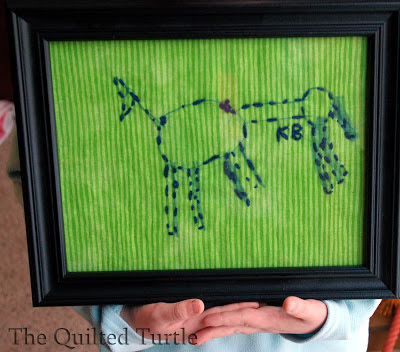 I found some leftover material and a quilting hoop, she drew a picture of a horse on the fabric, and I showed her how to stitch around her drawing. (She didn't notice that the horse has six legs until after she was done.) I threw her finished piece into a Dollar Store frame I had laying around and we had a masterpiece. Mama wanted to keep it - after all it was her first sewing project, but she was adamant about giving it away. She insisted, "I want to give it to Lorma." "OK, but I'm curious - why Lorma?" I really was curious. There are lots of adults she adores and I wondered why Lorma got to be the lucky one. "Because Mama," she said, "Lorma knows how to sew. She'll know how hard I worked to make this for her." How could I argue with that? So a few days later we went over to Lorma's house to give her the horse. Our timing was perfect - when we walked into the house we found her sitting at her sewing table; the prefect place to get her gift. It now hangs in her entry way. At first I was disappointed that K wanted to give her creation away, but now I am thrilled. Sure, she could have kept it and hung it in her bedroom, where she (and I) would have enjoyed it. But giving it away made Lorma feel loved and helped K learn how wonderful it feels to give of one's self. Not to mention that wonky, lime green, six-legged horse puts a smile on everyone's face who walks in and gives it that "why-is-that-hung there" look, because they get to hear the story of why K wanted Lorma to have it. So sweet! Good job, Miss K!